Description: Thallus filamentous, up to 200 (-500) mm long. Erect vegetative system of branched uniseriate filaments; branching irregularly opposite. Occasional longitudinal cell divisions. Basal system of free filaments and rhizoids. Many discoid chloroplasts per cell. Unilocular sporangia intercalary, sometimes terminal; plurilocular sporangia also intercalary, sometime terminal. 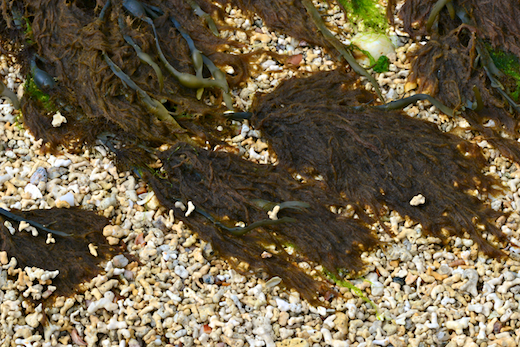 Habitat: Intertidal to shallow subtidal; epilithic or epiphytic, particularly on fucoids (particularly Ascophyllum nodosum). Occurs in marine and estuarine conditions. Key characteristics: Rope-like appearance; tolerance of emersion. Site © M.D. Guiry 2000 - 2019. Important copyright notice: all text, design and photographs on this site are copyrighted by M.D. Guiry unless otherwise stated and all rights are strictly reserved. Click here for copyright information and contact. Website design: 249 Design Studio. Site maintained by M.D. Guiry (michael.guiry@nuigalway.ie). There have been 8736594 page loads since 1 January 2014 on 25 April 2019.